7 But when he saw many Pharisees and Sadducees coming to watch him baptize,  he denounced them. “You brood of snakes!” he exclaimed. “Who warned you to flee God’s coming wrath? 8 Prove by the way you live that you have repented of your sins and turned to God. 9 Don’t just say to each other, ‘We’re safe, for we are descendants of Abraham.’ That means nothing, for I tell you, God can create children of Abraham from these very stones. 10 Even now the ax of God’s judgment is poised, ready to sever the roots of the trees. Yes, every tree that does not produce good fruit will be chopped down and thrown into the fire. Or, coming to be baptized. Simple lighting from the sun, on the right, illuminates this scene. John the Baptist on the left, a group of 4 Pharisees on the right. 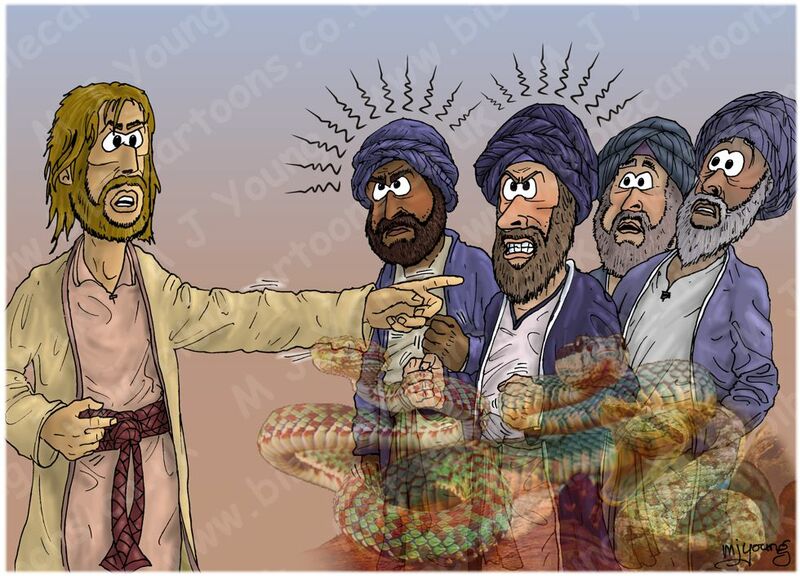 This scene illustrates John the Baptist strong condemnation of the Pharisees as a group of vipers. I decided to include some translucent viper snakes in the foreground, to emphasise his point! In the translation (NLT) above they are called a “brood of snakes”, whilst in other translations of the Bible they are called a “brood of vipers”. Viper snakes were/are common in Israel & the Middle East. In Luke 14 we read one of Jesus’ parables, which shows why those originally invited to the banquet won’t get in. The invited guests all make excuses why they can’t attend the party & so are excluded, in the end, by the Party-giver. I think this is a parallel, or explanation of why so many Hebrew people (the original party guests) where to be excluded from the party – they made too many excuses why they could not attend. 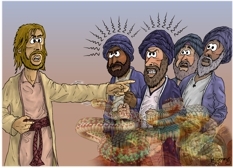 If this is so, then it might explain why Jesus & John the Baptist tended to denounce the Pharisees and Sadducees, who were prime examples of Hebrew people who didn’t want to accept the Party-givers invitation! I’m sure there are lots of other examples & explanations regarding this animosity.